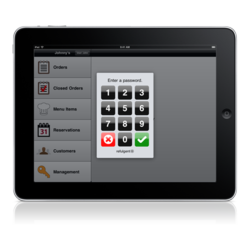 Ambur 1.9, an iPad POS, was recently released to the App Store. Offers better reporting, faster payments, and an increased efficiency in your business. An iPad POS and wireless ordering can change the way a business operates. Ambur 1.9 was recently released in the App Store, where the full list of additions is listed. Developed as an alternative to complicated and expensive point of sale systems, Ambur is an iPad POS that's easy to set up, affordable, and doesn't bind you to any monthly or reoccurring costs! Ambur has a one-time fee and allows you to connect as many devices within a single location as you want, acting either as terminals or mobile ordering devices. Everything can be set up on location—right in the palm of your hand! Separating our iPad POS from other iPad point of sale systems is that Ambur runs independently from the Internet. While a cloud-based system may sound fancy, if your connection goes down, your establishment is no longer operational. With Ambur, this is not the case, as your information is hosted locally in your own device. This is not to say you are without a cloud, as your entire database can be automatically backed up on Dropbox for free. Since it’s initial release, Ambur has grown significantly and has added many new features and functions. Perhaps most exciting this time around: more intuitive reporting. Item sales reporting, customer tracking, cost analysis, and inventory: all exportable to CSV files. "Ambur 1.9 makes the Ambur experience even more powerful, intuitive and connected. We are really excited to get our product to restaurateurs and our feedback has been extremely positive. It’s always satisfying to hear how an iPad POS and wireless ordering can change the way a business operates.” -James O’Leary, cofounder of Refulgent Software, LLC. Please visit our website for more information on our iPad POS system, and do not hesitate to download Ambur free on the App Store.